Here is an old Sams Auto Radio Service Manual Vol 2. It is the 1953 Edition and is the Fourth printing on December 1956. 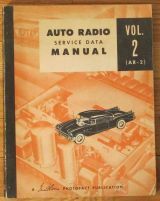 The AR-1 book includes schematics and service information for car radios between 1949 and 1951.